The northeast and east flanks of Mount Adams are the least visited but most spectacular part of this great volcano, a magnificent cathedral of vertical rock spires, overhanging ice cliffs, tumbling glaciers, and jagged lava flows. I had become increasingly fascinated with this side of Mount Adams since skiing the Lyman Glacier in June 2004 (see TAY report) and then returning to hike up the Ridge of Wonders in late summer and the Highline Trail to Goat Butte in early fall, for amazing views of the Klickitat, Rusk, and Wilson Glaciers. David Coleman had joined me on the Goat Butte hike and shared my desire to explore and ski the glaciers of the eastern flank. Unfortunately, this bizarre season featuring the worst snowpack in WA since 1941 followed by generally unsettled spring weather had conspired against our plans. Finally, in late May a high pressure window opened and we knew that it had to be now or wait till next year. We left Seattle at 6 AM and drove via SR 410, 123, US 12, FR 21, 2160, 56, and 2329 to reach the Muddy Meadows trailhead at 4400 ft in 140 miles (access via SR 7, US 12, and FR 23 to 2329 is simpler but longer, about 150 miles). We took in a great view of the north side of Adams and hiked up the bare trail with heavy loads at 10 AM, passing the first snow patch just above 5000 ft and reaching much deeper snow by 5400 ft. Frustratingly, the trail was covered by 0-3 ft of discontinuous softening snow, but it was easier to detour through the open snow-free woods along the trail edges whenever necessary (no need to worry here about trampling vegetation by going off trail, the heavy summer horse traffic has done far more damage than any number of hikers or skiers could possibly do). We finally reached (seemingly) continuous snow at 5700 ft and switched to skis and skins, only to be confounded minutes later by more discontinuities and bare meadows. We linked the various snowpatches along the trail to near Foggy Flat and then headed directly south up a creek drainage towards the Lava Glacier. The snow was continuous above 6000 ft and we finally made quick progress, reaching a fine campsite among the highest trees at 6600 ft below the glacier by 2:30 PM, shielded from a gusty easterly wind by a ridge of lava. After a lengthy relaxing lunch, we skinned up the Lava Glacier (very minimal crevasse hazard) to a large flat area at 8500 ft and skied back down to camp after 6:30 PM, on initially crusty then nice corn-like snow. Despite the warm temps (12000+ ft freezing level) and brilliant sunshine, the gusty wind never relented and kept the snow firm enough into the evening. During dinner we planned the next day's traverse route over to the Lyman, Wilson, and Rusk Glaciers, hoping to wake at 5 AM and be skinning up by 6. Overnight the winds grew stronger, and by 5 AM they were howling through our campsite despite the protecting rocks. Although we couldn't see each other's bivy sacks, through unspoken communication we both knew that neither of us wanted to get up. Our fitful sleep continued until 8 AM, when the increasingly blinding sunshine forced us to arise. We considered abandoning the trip, as the thought of skiing in 50+ mph winds higher up held little appeal, but eventually the winds abated slightly and we knew we should give it a shot. We skinned out of camp at 10 AM, bundled up despite the bright sun and moderate temps. 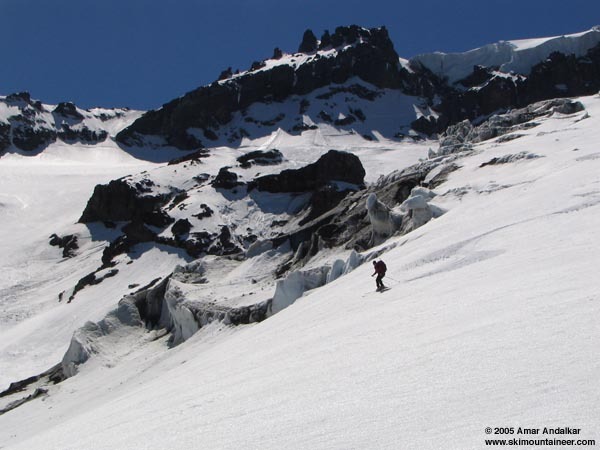 We aimed SSE towards the prominent 8440 ft Lyman-Wilson saddle, hoping to find a continuously skiable path through the numerous terminal and lateral moraines of the Lava and Lyman Glaciers. We passed though a minor gap at 7600 ft and dropped onto the Lyman Glacier, losing less than 100 ft in a descending traverse onto the uncrevassed lower glacier. Spectacular views up the twin steep icefalls of the Lyman, the north portion looks to be in excellent continuous shape for a ski descent while the south portion looks much more broken and hazardous up high than when we skied it a year ago. We continued across and up easily to the Lyman-Wilson saddle and traversed south across the Wilson Glacier, holding steady elevation near 8400 ft as much as possible. A huge rock monolith and massive ice cliffs and icefalls towered overhead. We reached Victory Ridge which separates the Wilson and Rusk Glaciers near 8400 ft and skinned up the ridge to 8800 ft, which offers the only easy high access onto the Rusk (steep cliffs line the south side of Victory Ridge above 9000 and below 8800 ft). We could have easily skinned (minimal crevasses) up to the bergschrund at 10200 ft at the head of the Rusk, but given the late hour (2:30 PM) it was time to finally ski! The center of the Rusk Glacier is heavily broken by a major serac field and a large cliffy nunatak, while the northern edge offers a smooth steep perfect ski run (the southern edge is steeper but less smooth, with some crevasse hazard). We zipped down the north side run on excellent corn (see photo below), preserved by the wind despite 8 hours of direct sun on the easterly aspect. Snow stability was excellent, much better than expected given the warming trend of the previous 2 days (a special bulletin from the NWAC had also warned of "increasing avalanche activity expected at higher elevations"). A small break in the lateral moraine at 7800 ft offers the easiest exit from the Rusk and we dropped NE through it onto the broad open plains of lower Victory Ridge. We skied down to about 7400 ft, then skinned back up west and gained the edge of the Wilson Glacier near 8200 ft, continuing back NW in a rising traverse to the 8440 ft Lyman-Wilson saddle. We skied down the lower Lyman Glacier on more excellent corn (NW facing slope), then cut a high angling traverse over to the 7600 ft gap and skied down the moraine valley back to camp. Packed up, skied down to Foggy Flat at 6000 ft, and hiked back to the car by 9:30 PM, just before headlamps were necessary. Corey Bloom met us at the trailhead, as David planned to drive his car back to Seattle (and work) while Corey continued with me down to Oregon and California, planning to ski some big volcano lines including Mount Shasta. Anyway, this was an extremely scenic and interesting trip, about 25 miles total distance with 7600 ft of total ascent for nearly 6000 vertical ft of fine skiing on 4 spectacular glaciers. Despite not even breaking 9000 ft in elevation, this was one of the nicest trips I've ever done on Mount Adams, much better than slogging up the standard South Spur route. David carves the perfect corn beside a maze of seracs on the Rusk Glacier, with the rock towers of The Castle and the edge of the summit icecap looming overhead. See also a larger version of the map, 140 KB, or the full-size version, 912 KB. Note that there are several glitches in the GPS track, and the GPS finally went nuts at the edge of the Rusk Glacier, so the last part of the route is hand-drawn. A note about access and legality: The Wilson and Rusk Glaciers lie within "Tract D", a portion of Mount Adams which was transferred from the Gifford Pinchot National Forest to the control of the Yakama Nation in 1972. Public access is apparently allowed only between July 1 and October 1, although this appears to be enforced only on the developed area near Bird Creek Meadows and Bench Lake on the southeast flank. For those who wish to remain on firmer legal ground, in a normal snow year our route and the Wilson and Rusk Glaciers should be skiable and worthwhile well after July 1, although June would probably offer the most ideal conditions. For what it's worth, it appears that several first ascents of routes on the east side of Adams (listed in Beckey vol. 1) were done outside the allowed access period. A finely crafted and very informative report, Amar. Excellent report and pictures, Amar. Thanks! Now that's a good trip report! No summit? What's there to comment on? Of course, I'm just jealous that I didn't get to go. Now thats ski mountaineering. Way to find a line in a bad glacier season. I have checked out your web site in the past it's a fun site. Thanks for all of the kind comments. 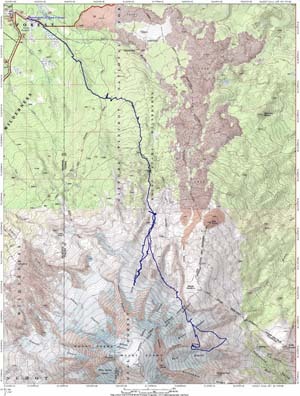 I've added a topo map with a GPS track of our route to the original post. This was really a great ski mountaineering tour more than anything else, skiing on and across very moderate glaciers and terrain but with mind-blowing steeps and cliffs and icefalls looming overhead the whole time. Which gps unit are you using?